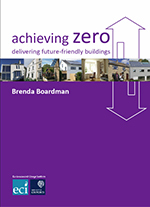 The "Achieving zero: delivering future-friendly buildings" report provides the policy framework to ensure that all energy use in all buildings in the whole UK results in zero carbon emissions by 2050. This covers 26 million homes and 2 million business (ie non-domestic) properties. The study views the challenges from a people’s perspective – the roles of the property owner and the occupant – with the implications for energy supply one of the results. The emphasis on energy services, rather than energy purchases, shifts the debate on to demand reduction rather than energy supply and on to lower, not higher, bills. Investing in greater energy efficiency provides users with a better standard of living: a future-friendly property is one that it is warmer, more comfortable, healthier. The report was launched by Dr Brenda Boardman at the Energy Retrofit 2012 conference in Salford on Wed 24 January 2012. Achieving zero provides the policy framework to ensure that all energy use in all buildings in the whole UK results in zero carbon emissions by 2050. This covers 26 million homes and 2 million business (ie non-domestic) properties. Full report: Boardman, B. (2012) Achieving Zero: Delivering Future-Friendly Buildings. ECI, Oxford. ISBN: 9781874370512.